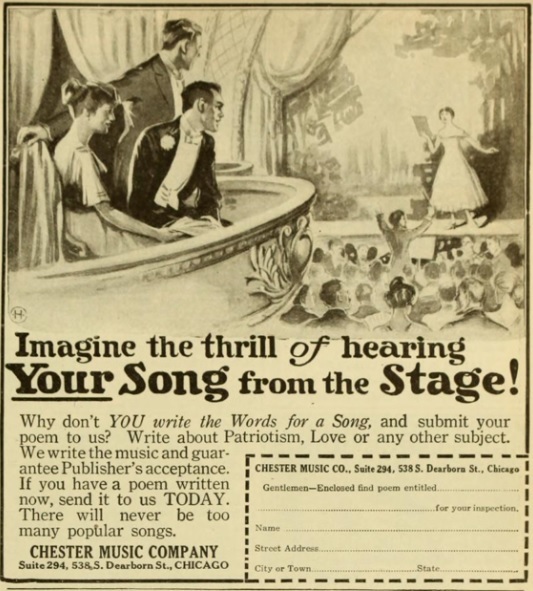 Before we get to a truly spectacular, nearly undefinable find, here's another vintage song-poem ad, in this case from a 1919 edition of "Photoplay" magazine, courtesy of Pete. This one has a great sales pitch, and an even better drawing! Feel free to print this out and send it in - I wonder what would happen!?!? The Halmark saga continues, in a direction I never would have guessed. In the last few years, I've come to realize that some of the endlessly repeated Halmark backing tracks began life as music beds for covers of 1960's hit songs﻿, including "Gentle on My Mind". 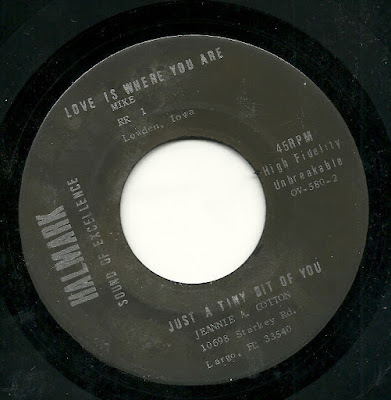 I've also come across a record purporting to present "By the Time I Get to Phoenix" as a Halmark original, and, most recently, found a record where Halmark actually made a good-faith effort to record a backing track that sounded like it fit in the '70's. What I didn't expect this time, and what nothing I'd ever heard or seen about the label had indicated before, is that they accepted vanity projects. And that is the only possible explanation for the existence of the song "Love is Where You Are", identified only as having been written by "Mike" (no last name) of Lowden, Iowa. My guess is that's Mike singing it, too. And a more incompetent performance (of nearly four minutes) I've rarely heard, on a song-poem or anywhere else. This record truly blows my mind. I will say no more, but would love to hear the reactions of the rest of you, in the comments. 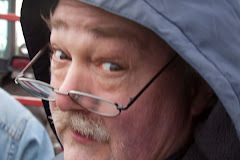 My guess is that your mouth drops open and stays that way - I know mine did. The remainder of the EP contains the typical Halmark cheesiness, made even more unlistenable by a ridiculously trebly mix, one which hurts my ears at times. First up is a particularly bad lyrical construction called "Just a Tiny Bit of You", sung by the inevitable Jack Kim (although, as is true more often than not with this label, no one is identified as a performer on the label). This is set, by the way, to the backing track from Halmark's aforementioned version of "By the Time I Get to Phoenix". 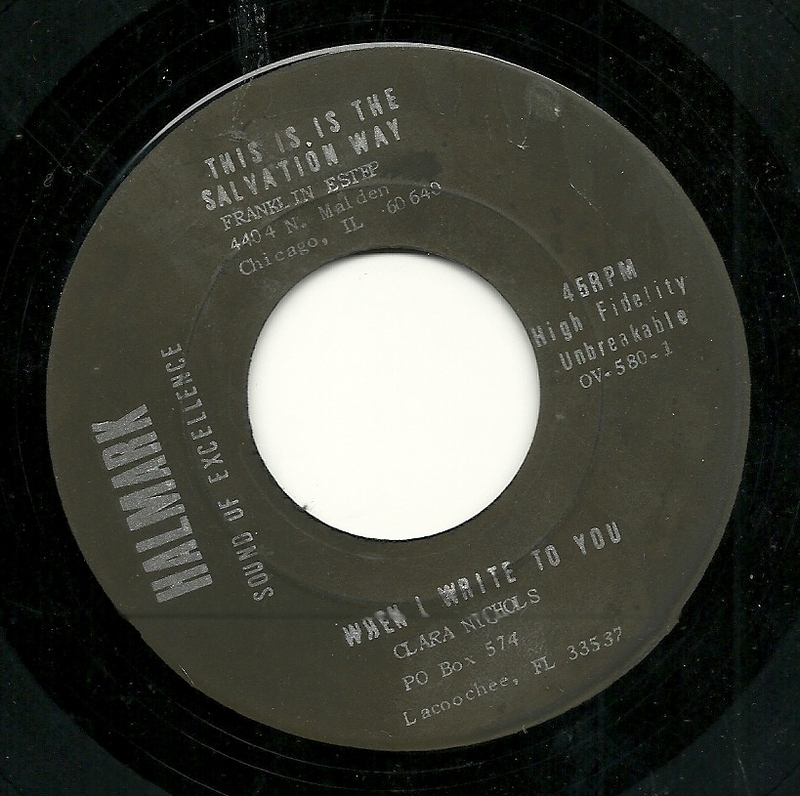 To my ears, the worst of the three "standard" Halmark tracks on this EP is the religiously themed "This is the Salvation Way" sung by Kim and his wife. But for sheer ridiculousness, you CANNOT beat "When I Write to You", a song-poem about writing poems which contains some of the worst, simplistic lyrics I can ever recall hearing. Seriously: "Writing a letter is lots of fun, when I'm writing". And then there's the big build up to the last line, in which Jack Kim gives his all to excitedly sing what are among the least effective final six words of any song I've ever heard. And speaking of Pete, he made a request nearly four months ago, which it has taken me forever to get to. However, with the horror that is about to be visited upon us around midday on Friday in Washington, D.C., it turns out that the delay has pushed my honoring of Pete's request to the perfect time. For today, we will remember that point at which multitudes of song-poets descended on the song-poem factories en masse and demanded to have music set to their songs praising a new president: Jimmy Carter. Jimmy Carter's move to the White House (as was also true of the death of Elvis Presley several months later) came around one of the heights of the popularity of song-poem companies. The volume of product that the big labels pumped out in the mid- and late- 70's is astonishing, and most of it (to my ears, anyway) far crappier than the earlier material. But such was the volume of submissions, that Preview records was able to press an entire album of songs about Jimmy Carter. And it is this album that Pete asked me about. The most famous song from the album is "Jimmy Carter Says Yes", which was on the first two song-poem compilations, and which is easy to find online. Pete asked me if I owned the album. I don't, but I do have two other tracks from this Gene Marshall spectacular, obtained in my early days of collecting via cassette tape trade. And so, today, here are two songs for one of the great Americans of our time, as we prepare for the assault by one of the far lesser Americans of this, or any time. 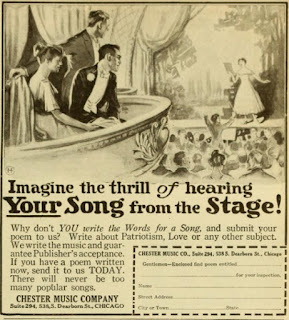 First up, the title song from the album, "President Jimmy Carter, We Salute You", written by James Wilson, Jr., and featuring some of the tortured syntax which is a hallmark of his compositions (although it is missing the made-up words that occur in many of Wilson's most interesting songs, such as "Liblanders Cahoot"). And here is the other song I have from that album, "What A Man, A Man's Man! Jimmy Carter", written by the absolutely wonderfully named Waskey Elwood Walls, Jr.
See you next week. If there is a next week. HAPPY NEW YEAR!!! 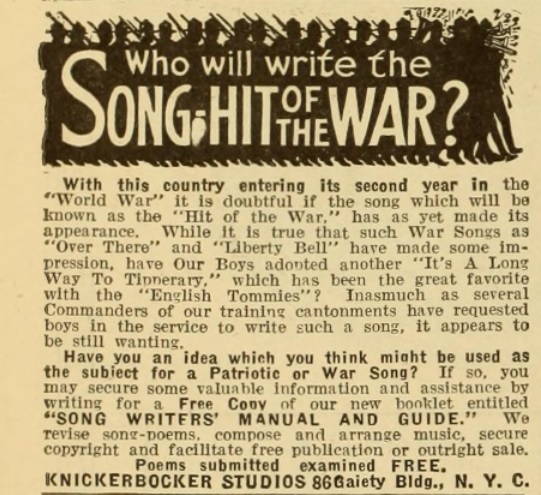 To kick off the new year right, here's an amazing ad, again sent by correspondent Pete, dated 1918, from Photoplay magazine, and encouraging all songwriters to have a go at "writing the SONG HIT OF THE WAR". That's a spin I hadn't encountered before, and a fairly reprehensible one, if you ask me. Just astonishing. Today, a record on Preview which is unusual for a couple of reasons. First, it has Gene Marshall on one side and Rodd Keith on the other. That's not unheard of, but it's far from typical. 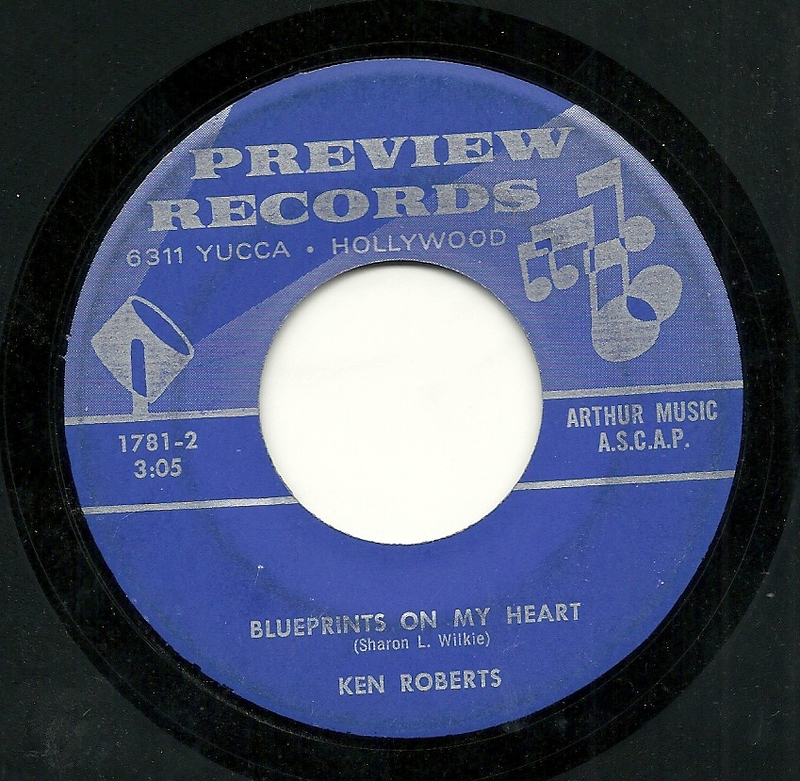 Second, Rodd is credited here as "Ken Roberts", a moniker that he appears to have used only on a handful of records, circa 1970-71. I believe this is the only "Ken Roberts" record that I own. 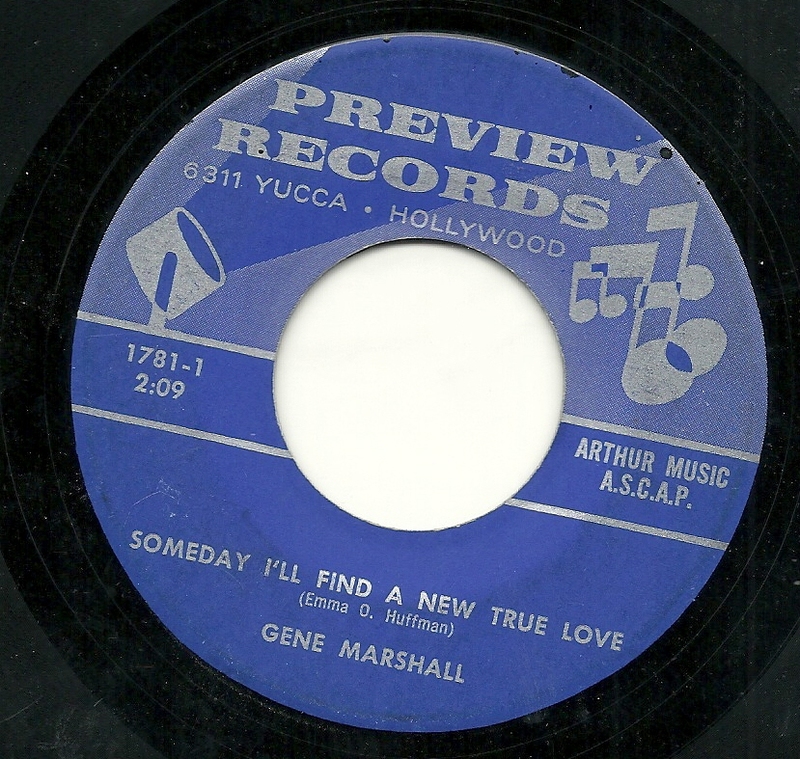 Finally, my preference, by a wide margin, is for the Gene Marshall side, which would not typically be anybody's guess if you were to combine these two singers during Rodd's Preview years, much as I often just love Gene Marshall's performances. And admittedly, the Gene Marshall song here, "Someday I'll Find a New True Love", is no great shakes as a song or a lyric, and the vocal is fine, but nothing special. But I dig the hell out of the band's performance, especially some truly special work by the drummer, whoever it was. This is not something that I am typically drawn to, but boy, do I love the drumming on this record, even if its just a series of nice - at times Ringo-esque - fills. See what you think! 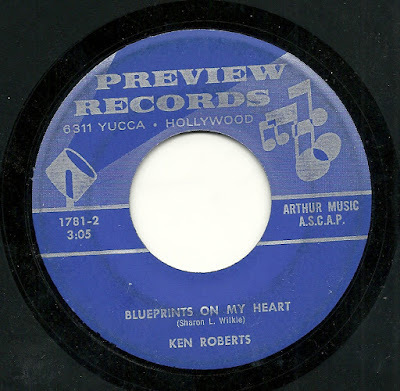 From the flipside, here's Rodd, as Ken Roberts, with a song titled "Blueprints On My Heart" (although the sung lyric is "Blueprints To My Heart"). Either way, that's an interesting metaphor, and I'd appreciate someone doing something interesting with it, but this is dreary by every measure. Draggy, uninspired musically, and it seems to go on forever (even though it's barely three minutes long). Your mileage my, of course, vary.